LONDON – With the transfer market drawing ever so close and Chelsea struggling in the defense of the Premier League crown, here are three headlines buzzing about the reigning EPL champs. Radamel Falcao Can’t Leave: Chelsea were hoping to ditch the flop in the January transfer market, but it is being reported by the Daily Mail that Jose Mourinho is stuck with the Colombian striker. 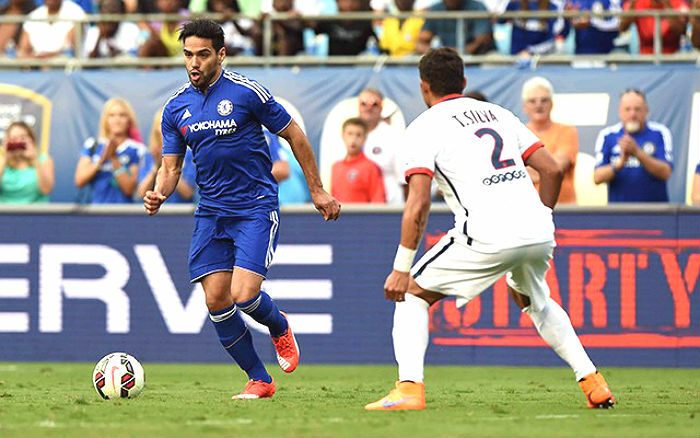 After failing to impress at Manchester United last season, Falcao moved to Stamford Bridge in an effort to revive his career. However, it is the same ole story for the out of form forward who clearly has fitted in with the Blues. According to the Daily Mail, Mourinho is looking to have the loan deal for Falcao terminated, as he tries to clear space for a real striker. But apparently his parent club Monaco are reluctant to allow the forward to make a return in January, given his unimpressive form which comes with a large £265,000-a-week salary. Chelsea Ready To Rival Manchester United For Striker: The EPL champions are off to a dreadful start to the season and one of the main reason is the lack of consistency up front. Last year playmaker Eden Hazard and forward Diego Costa were firing on all cylinders, but things aren’t going according to plans for Mourinho this season. The Portugal coach is determined to freshen things up and the Daily Express is reporting that Chelsea is ready to challenge Manchester United for Bayern Munich forward Thomas Muller. The German World Cup winner is one of the hottest attackers in Europe at the moment, so it is difficult to see him leaving the German champions for the EPL strugglers, especially when they are not even in the title race, or better yet, in the hunt for a Champions League spot. Diego Costa Looks Like A Goner: Something isn’t quite right with the Spanish striker this season and following his crazy act which saw him throwing his bib at Mourinho at the weekend, the Daily Express is reporting that the forward’s long-term future at Chelsea is now in doubt. Diego Costa has been in stifling form since the start of the season and he’s apparently not happy with his current situation. The player was dropped to the bench before being an unused substitute in the 0-0 draw at Tottenham over the weekend. Costa was clearly not amused by his boss’ decision to snub him for two youngsters in a game the Blues needed points and he showed his anger just before the end of the game. Mourinho said after the game at White Hart Lane that there is no issue between him and Diego Costa, but even a blind man can see that the pair currently aren’t seeing eye-to-eye and a separation is imminent. And while Chelsea have no plans to exchange for the controversial striker in January, the Daily Express is reporting that the club might be willing to end the short relationship at the end of the season. Chelsea are currently sitting 15th in the EPL standings and surely cannot catch the likes of Manchester City, Arsenal, Manchester United and the other top runners in the title race.